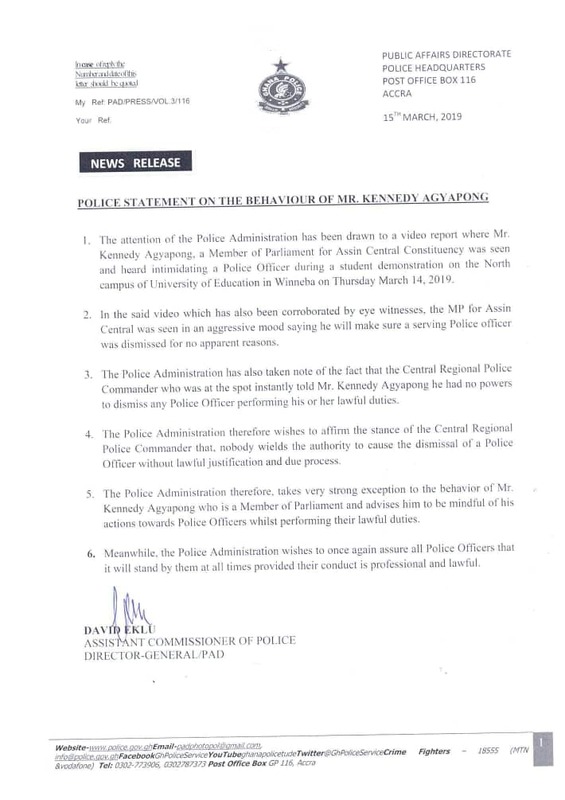 The Ghana Police Service has cautioned Assin Central Member of Parliament, Kennedy Agyepong, asking him to be mindful of his actions and utterances. The caution to the NPP firebrand comes after Mr. Agyepong was seen on video verbally abusing a police officer during Thursday’s demonstration by students at the North campus of the University of Education, Winneba (UEW). Mr. Agyepong was heard in the video threatening to cause the dismissal of a Police Officer in the presence of the Central regional Police Commander. But the statement signed by ACP David Eklu, Director-General of the Public Affairs Department of the Police Service stated that nobody can cause the dismissal of an officer who acts professionally. The statement also assured all officers that they will be protected as long as they do their work diligently and lawfully. The post ‘Be mindful of your actions’ – Police caution Ken Agyepong appeared first on Ultimate FM.